Oh, the Folly of Slackers! A shadow darkened a sunlit cedar trunk. Elk moccasins paused, just before a sleek doe stepped into view. 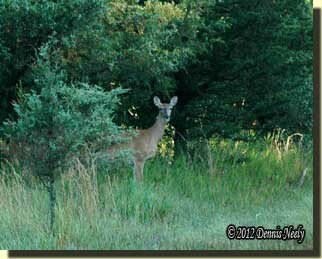 With ears twitching, the cinnamon-colored deer looked left, down the hill, then up the trail that ran beside the cornfield. She sniffed, then in aggravation swung her head around and chewed at the flies swarming around her shoulders. She took another step, still sequestered in the morning’s long shadows. The air smelled plain, like it does some days in late March, but this was early July, in the year of our Lord, 1795. I felt the ax handle press against my own collar bone, just as the Northwest gun does when the leaves change and I spy a whitetail before it discerns my human form. A young cedar tree, barely head high, stood between us. I sensed the casual breeze and knew I was safe from detection and free to watch. I anticipated seeing a spotted fawn, maybe two, but such was not the case. The green blades of prairie grass shimmered with a thin, silvery coating of fresh dew. A red cardinal winged across the trail, then disappeared in a tall, full-boughed cedar. The wind rustled leaves on the corn’s drought-stunted stalks. Without thinking, I rolled the ax handle in my hand to ease the throbbing. I suppose that, too, is not unlike my penchant for tracing circles on the trade gun’s hammer screw while I await a deer’s next move. The doe never saw, but instead strolled off into the cedar grove. A few footfalls down the trail I paused again, this time to marvel at the orange blossoms on a bushy butterfly weed. I wondered where the yellow and brown butterflies were, but a woodcutter’s lot is not to dally, but rather proceed on to the day’s work. I straightened and looked about. A wild turkey’s head popped up some distance to the south, next to a patch of milkweed yellowed by scorching days and rainless nights. Again I waited until the gray-headed hen turned her attention back pecking. Deer flies buzzed about my headscarf, but the salt-stained cloth kept the little beasties from burrowing into my long, gray hair. I glimpsed the top of the next tree to fall, down the hill and around to the left, and in that instant I envisioned the morning sun sparkling off the River Raisin, not that far distant. In my mind I saw geese and swans and wood ducks paddling amongst the lily pads and cattails. I heard the ash paddle slip quiet into the river’s tepid water and saw the ripples stream from the canoe’s bow. Oh, the folly of slackers! The evening before, with arms weary from wielding the ax, I cleaved the lower branches from the next tree in preparation for that morning’s task. The felling ax struck hard. The trunk shook. Yellow sapwood chunks flew. With each blow, dead “needles” cascaded earthward like a heavy, prickly snow. As the felling notch took shape, sweat beaded on my brow; droplets began dripping down the nape of my neck. Before starting the first side cut, I stepped back, leaned the ax against the trunk and pulled the drab-green cloth from my head. Sweat moistened the lower edge, a ways from the telltale white salt line that marked the intensity of past work sessions. I shook free the brown needles that stuck to the crown and hid within the folds. Without thinking I wiped the perspiration from my forehead with the cloth. I thought about hanging it on a nearby branch, but persistent deer flies changed my mind, as did a conscious consideration of the blizzard of needles yet to fall. I sipped water from a pewter flask, the one my father gave me, poured a few precious swigs into the cloth and rubbed the water into the fabric, knowing it would cool my head. I then set about cutting the next notch. As we sat, I was bare headed, as were the others around the crackling yellow flames. The comment took me a little by surprise, not that the statement was offensive, but rather that I had not thought about it in a long time. He went on to say that he based his opinion on his careful scrutiny of the photos that accompany my scribblings and those in the albums that I have available for guests to browse at the outdoor shows. I started wearing a head scarf to comply with hunter orange regulations, because it was the least intrusive solution for my 18th-century hunting scenarios. Plus, my orange knit cap was too warm for the fall hunts. The choice was also driven by financial considerations. At the time, my best understanding of a common Great Lakes hunter in the 1790s suggested any number of felt hats, but the documented varieties all sold for way more than I could afford. The head scarf option came with the right price tag, but not without some concerns. From the documentation that I had, the use of head scarves seemed to be indicative of a strong Native American influence. 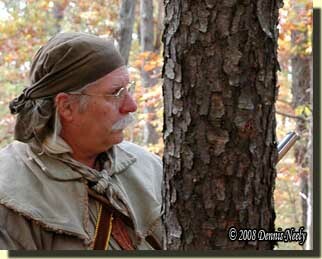 Portraying a hunter providing meat for a somewhat remote trading post, my persona would have been in constant contact with the Potawatomi, Ojibwa and Ottawa peoples, but there was a concern in my mind about the commonality of the use among hunters of English descent. A head scarf is lightweight, easy to fold, easy to stow when not needed and cost effective. It does not shade the sun like a broad-brimmed felt hat does, but my alter ego prefers to traverse the glade in the shadows, rather than in the open prairie for all to see. It keeps my hair clean and dry, and in warm weather, a wet head cloth cools and refreshes. A workman’s cap might serve the same purpose, but after years of satisfactory use, I find a head scarf hard to give up. But in the true nature of this fantastic hobby, my thoughts and understanding are constantly changing, constantly moving forward. 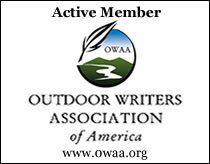 This entry was posted in Clothing & Accoutrements, Persona and tagged Dennis Neely, historical trekking, North West trade gun, Northwest trade gun, traditional black powder, traditional black powder hunting, traditional blackpowder, traditional blackpowder hunting. Bookmark the permalink.